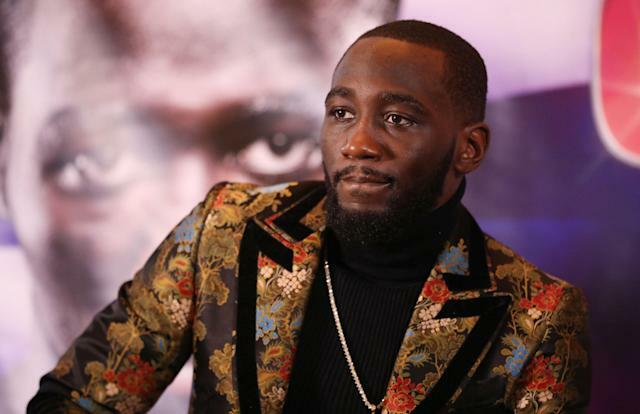 For more than 20 minutes, Terence “Bud” Crawford sits in the chair and speaks passionately of his life, his sport, his ambitions and his motivations. The WBO welterweight champion is engaged in the conversation, leaning forward, occasionally smiling, speaking expressively. The video above is a glimpse into the soul of this most private of men who is in the most public of jobs. Most fighters don’t like talking to the media during fight week, when their anxieties are increasing and the pressure is ramping up. No boxer is ever going to say, “Hey, I’m bored. Let’s go find some boxing reporters to talk with.” But many of them understand their need to control the narrative and so they attempt to harness the media, use it to their advantage and to lead the conversation. For most of his career, Crawford has shown disdain for that process. His view is simple: If you can’t see how great what he’s doing in the ring is, then he doesn’t have much need to talk to you. It galls him, though, to have to say it himself. But that’s the job of an A-side in a pay-per-view bout, which Crawford is on Saturday when he defends his title against Amir Khan at Madison Square Garden. Crawford is the best fighter in the world, unbeaten and unchallenged, and with more nuance in his game than anyone in this generation with the exception of Floyd Mayweather Jr. But he has to sell himself to make this fight financially viable, and it’s clear it nags at him that he has to do that. So, after engaging in a back-and-forth, when the camera shuts off and the lights come on, Crawford stands up, expressionless, and without another word quickly leaves the room. He let his interviewer into his world for a few minutes, only for the task of selling his fight. Once that was done, he was up and out of the chair without comment, without emotion, without so much as a goodbye. Like all fighters, Crawford has an ego, and the best way to get to his heart is by complimenting him. His octogenarian promoter, Bob Arum, has learned that over the years. Crawford would burn when he’d hear Arum rave about Vasiliy Lomachenko and say he was the best fighter he’d seen in years. Arum has learned to play the game with him now. Few would deny Crawford’s exceptional ability, but he hasn’t had that one opponent who would help cement his greatness. Sugar Ray Leonard, one of the greatest fighters who ever lived, had plenty of those kinds of opponents. Leonard is the guy who, in many ways, Crawford aspires to be. Leonard was a superstar the minute he turned pro after winning a gold medal in Montreal at the 1976 Olympics. He was in commercials and was on the cover of just about every important magazine before he’d ever thrown a punch for pay. Crawford came up with little acclaim, and he was virtually unknown until his 20th pro fight, when he waltzed past Breidis Prescott. Arum promoted many of Leonard’s fights, and said he sees many of the same things in Crawford that he saw three decades ago in Crawford. “When you talk about the great ones, I think you have to go all the way back to Ray to find an apt comparison for [Crawford],” Arum said. Crawford is, by Yahoo Sports’ estimation, the No. 1 pound-for-pound fighter in the world, just ahead of IBF welterweight champion Errol Spence Jr. and Lomachenko, the unified lightweight champion. Khan will provide him with his most significant rival in terms of notoriety and, perhaps, talent. Derrick James trains Spence, Crawford’s primary rival for the top spot at welterweight. But James almost gushes about Crawford when he discusses his talent. James isn’t about to put Crawford on the same level as Leonard yet, particularly when Crawford hasn’t had anywhere near the opposition that Leonard faced regularly. “I think he’s a very good fighter and two years ago, I think he should have won Fighter of the Year [from the Boxing Writers Association of America] instead of Lomachenko,” James said. Crawford unified his division, the light welterweight division. That’s something that hasn’t been done in many, many years. He’s a real fighter, man. Crawford revels in such praise, because he’s been through so much to get to the top, or even near the top. At one Lomachenko fight, Crawford became annoyed when one prominent member of the boxing media spoke glowingly of Lomachenko and was seemingly trying to get Crawford to agree. He would have none of it. He wouldn’t go along just to get along. He lets his guard down occasionally, far more so than he did prior to a 2015 trip to Africa in which he went with an elementary school teacher to help dig wells for people in poor villages who were without clean water. He said families that had once fought to the death make peace and become friends, and it changed him in some not-so-subtle ways. “I’m the type of person who always holds grudges,” Crawford said. “That was a wakeup call to me. Life’s too short to hold onto little things. Those people out there, they have nothing. When I say nothing, it’s like, the water’s bad. The food, if you don’t have your own garden and your own chickens, your own food, it’s hard living. And those were people we’d say are middle class, and got money. Crawford will be happy to receive the acclaim from the fans and the boxing media, even though he professes not to care. Bradley, who fought three times with Manny Pacquiao and knows something about the pressures of selling a pay-per-view, said not to left Crawford’s gruff exterior fool you. Like most fighters, Bradley said, Crawford cares deeply what is said and written about him. 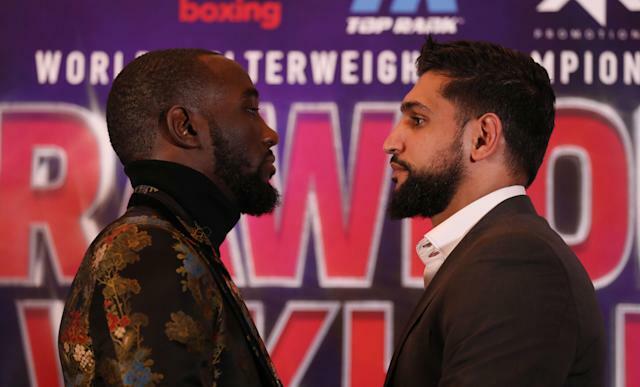 So as they head into fight week, Crawford faces a dilemma: He is widely expected to beat Khan, and not many expect the bout to be all that competitive. Bradley is one of those who believes Crawford will tear through Khan on Saturday. Crawford’s second challenge, though, is the pay-per-view sales. The expectations are modest for this, and a total of 300,000 would probably be considered a grand slam. But since Mayweather pushed it so much, fighters are judged almost as much by their pay-per-view sales ability as they are their ability in the ring. Crawford is a superstar when it comes to those 36 minutes inside the ropes. But he’s very much a neophyte when it comes to selling pay-per-view. It’s flown so far under the radar that James, who hopes to see Spence fight Crawford in a lucrative bout soon, wasn’t sure when it was taking place.